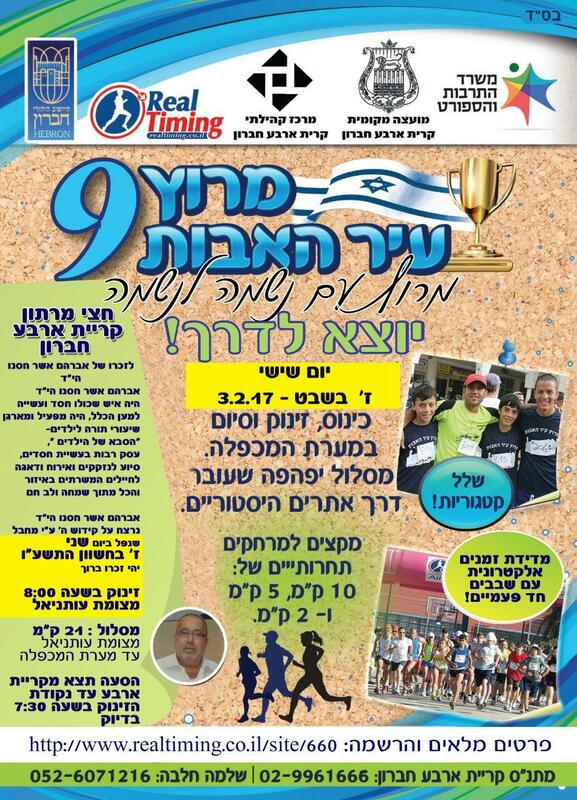 The 9th annual Hebron Race will take place the morning of Feb. 3, 2017 / the 7th of Shvat 5777. Referred to in Hebron as the "Ir HaAvot Run", the route will pass through Kiryat Arba the historic sites of Hebron including the Tomb of Machpela. Options for 10k, 5k, and 2k races. Half marathon of 21k will start from Otniel junction. Awards for different age categories. Sponsored by: The Ministry of Culture and Sport, Real Timing, The Jewish Community of Hebron, Kiryat Arba-Hebron Community Center, Municipality of Kiryat Arba and Hebron, the Hebron Fund, and more. Sadly, this year's race is in memory of Abraham Asher Hasno hy"d of Kiryat Arba who was killed al Kiddush Hashem (glorifying G-d's name), when he was run over by a terrorist last year on a Hebron Hills road. Abraham was a man full of good deeds and a doer for the greater community. He organized and taught Torah classes for kids in Kiryat Arba and was known as 'the grandfather of the youth'. With a full and happy heart he always helped people in need, worried about their well-being, and provided food and assistance to local chayalim (soldiers). May his memory be blessed.